Boxted Hall is a romantic country manor, found deep within the lushest of Suffolk parkland. Sleeps up to 26 in 13 bedrooms with 11 bathrooms. Weekends from £3,800 to £4,800, full weeks from £4,800 to £6,300. For shorter stays please enquire. If fully occupied, price per person per night is usually between £26 and £62. In the late 1970s a friend of the owners asked whether she could bring some friends round as they needed a place to stay for the night. They still hadn't turned up by 9.30pm so the landlady (the current owner's grandmother) decided to head up to bed - leaving a note: "Gone to bed - sausages in the fridge". The guests did eventually arrive and turned out to be the Rolling Stones, and the sausages were all eaten! Boxted Hall is a splendid country manor house near Bury St Edmunds, in Suffolk. The front door is reached across a moat, over a beautifully romantic stone bridge. The house is ideal for weekend parties with family and friends, and great for weddings or special celebrations. The lay-out of the reception rooms and bedrooms means it also works well for corporate use. The house sleeps up to 26 guests in 13 bedrooms, 9 of which are en-suite (the last four bedrooms are in the attic, and share two shower rooms). 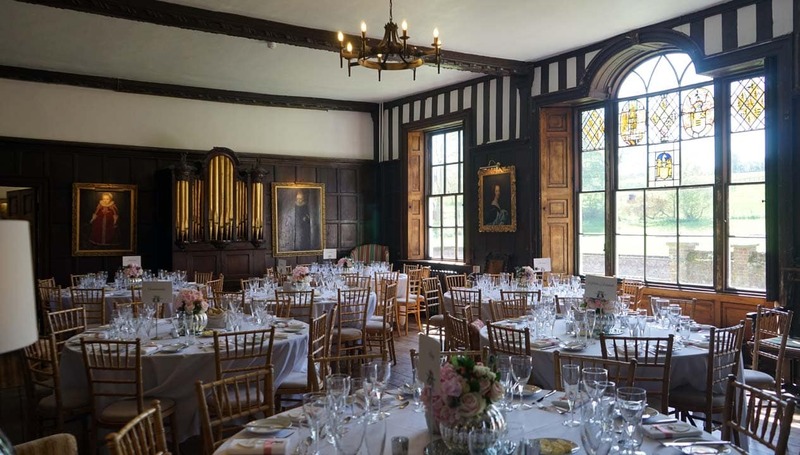 Downstairs, there’s the Hall, which seats 26 (and is perfect for dancing), a dining room (which seats 16), an oak-panelled library (complete with squashy armchairs and lamps and a secret door), and an elegant drawing room with a grand piano. There’s also a big, well-equipped kitchen and a games room, in which to play billiards. It’s the games room that’s behind the secret door (happily). The house is set within 250 acres of Suffolk parkland, and the gardens offer lots of space for wandering and playing. The River Glem meanders through part of the walled garden, and there are two summer houses in which to seek shade or shelter, or to hold secret assignations). Energetic guests can play a few games of tennis, or clop their way around the croquet lawn, and the less energetic can float in the pool, beneath the orchard wall. Boxted Hall is about two hours’ drive from the middle of London, on the A134. The closest railway station is Sudbury, about twenty minutes away from the house. There are some beautiful villages near Boxted: Hartest, Long Melford, Hawkedon and Lavenham are nearby, with traditional pubs and little antique shops.Bury St Edmunds is 20 minutes drive away, should you wish to tour a medieval town, and Cambridge is an hour away, if you fancy something even older. Newmarket is about a thirty-minute drive from Boxted, if you’d like to plan a day at the races. There are lots of sporting activities that can be arranged close to the house, such as quad-biking, shooting and karting. 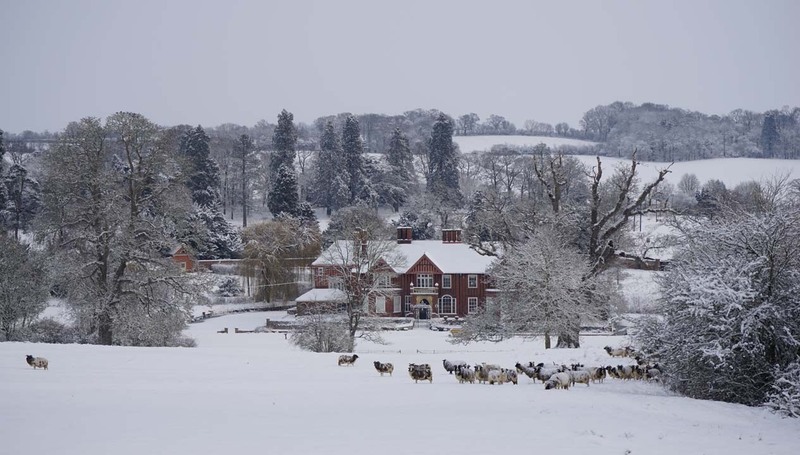 The house was built in 1392 by Sir John Poley, where once stood an older house, and the family have been in residence at Boxted Hall since 1398. The moat dates from this time and is still crossed by a bridge dating from the 11th century. In 1820, a family member added two wings, and re-faced the house with a red brick facade. Inside, the main hall still has its beautiful original oak panelling.